Coming face to face with Somalia’s al-Shabab | Life is short,have fun!!! 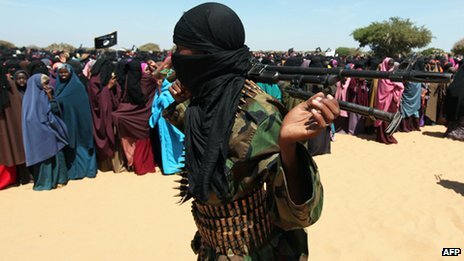 Freelance journalist Hamza Mohamed recounts the day he was able to put a human face to the Somali Islamist insurgent group al-Shabab, in this article published in the latest issue of the BBC’s Focus on Africa magazine. There is shelling not far from the hotel where I am staying. At the break of dawn I will be making my way out of Mogadishu and into al-Shabab-controlled Elasha Biyaha, to meet the group’s media coordinator. There I will request access to report from areas under al-Shabab’s control. Earlier in the day I made a call to see if the coordinator could meet me the next day. Surprisingly, he agreed to a 09:00 meeting. 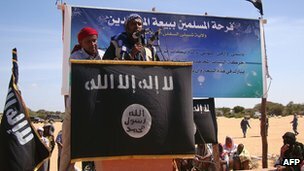 Al-Shabab are notorious for denying access to foreign media – let alone granting a meeting at such short notice. It is just after 06:00 when Nur, my driver, turns up at the hotel, but there is no sight of Awiil, my fixer. Nur tells me that Awiil, who has a young family, did not want to risk being caught in Somalia‘s ever-changing front lines. After about 15 minutes of driving at break-neck speed and negotiating two chaotic government checkpoints manned by nervous-looking skinny soldiers, we reach Elasha Biyaha. This is a “pop-up” town that came into being when Mogadishu’s residents left the anarchy of the city for the relative calm of its outskirts. In the distance we see a black flag hanging from a dried tree branch. Unlike the previous two checkpoints, there is no heavy presence of soldiers manning this one. It quickly becomes clear that this is one of the frontiers of the conflict: On one side the transitional government and African Union troops and on the other al-Shabab fighters. From the shade of an acacia tree two seemingly teenage boys – the younger-looking one with a shiny AK47 rifle hanging from his left shoulder – wave our 4×4 to the side of the road. What seems to be the elder of the two has a headscarf wrapped around his face. He stands back, letting the younger one approach our car. The tint on our car windows has attracted their attention. 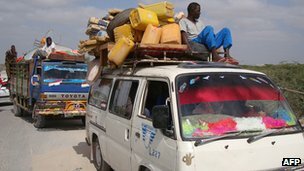 In Somalia, most 4x4s are tinted to keep the occupants’ profile as low as possible. He is not impressed. Nur acknowledges our “fault” and explains that we have our camera kit on the backseat and leaving expensive gear in a car with non-tinted window in Mogadishu is calling for it to be stolen. In a soft and polite voice, the teenager explains to us that tinting is not allowed and walks towards a house 500 metres away, telling us he is going to seek advice from what we think are his superiors. Nur and I turn to each other asking what other rules we might be breaking. I notice Nur still has his shirt firmly tucked. He quickly untucks it. Out of anxiety, I ask whether the al-Shabab youth might also take exception to my Nike trainers and we both break into nervous laughter. All this time the elder of the two boys is standing not far from our car – listening but not responding to our small talk. After waiting for about five minutes, while replays of press reports of al-Shabab’s notoriously harsh justice system run through my head, he comes back and tells us we are free to continue our journey but must wind down the tinted windows. We are at the frontline, but there is no sight of men in trenches. There is also no sight of pick-up trucks mounted with anti-aircraft guns. It is hard to imagine how this very lightly armed checkpoint was stopping the heavily armed government and African Union troops. Perhaps there were more fighters with superior weapons waiting in the nearby bushes. After a short drive we reach the centre of Elasha Biyaha, a beehive of commerce and trade. Unlike the battle-scarred buildings of Mogadishu all the buildings here are new, with their tin roofs glowing in the mid-morning sun. On both sides of the only tarmac road in the town, stores sell goods from matchsticks to sacks of rice. Also noticeably different from Mogadishu is the absence of men with guns in the streets of the town – even though this is a “front line”. People stop and stare at us, only for them to smile and resume their activities when I greet them in Somali. We head to the hotel where our meeting is scheduled to take place. We get there in time but there is no sign of our contact. A quick call and we find out to our surprise he is in fact in Mogadishu, a city controlled by government and AU soldiers, attending a funeral for two religious elders who died in the shelling the night before. After two hours’ wait a tall, slim figure with a goatee and a broad smile comes walking towards us. With arms outstretched, he says my name and gives me a hug as if I am an old friend. I ask how he picked me out of the crowd in the hotel. My heart goes into overdrive. How much more could he possibly know about me? What about my Twitter account? Does he read my tweets? Over freshly made mango smoothies, he apologises for not being on time. Probably in his late 20s, he looks nothing like you may imagine a typical Islamist insurgent to be. There are no robes or heavy beards. He is wearing a crisply ironed shirt and trousers with the Islamic scarf loosely resting upon his head, protecting it from the intense morning sun. As the main man of al-Shabab’s media campaign you would think he would be escorted by heavily-armed and masked bodyguards – but there are no signs of security or even a pistol for protection. As we are having drinks he notices I do not wear a wedding ring. The conversation changes to what kind of women I prefer, and why I have not married. He offers to assist me in finding a potential wife and he adds that if I cannot afford the dowry he will happily contribute. I had expected to be asked whether I pray five times a day, not about my taste in women. We talk until the midday call for prayers goes out, and I suggest we go to the mosque. Somalia brings out the fear of God in everyone. Nur and I are used to carrying our kit with us wherever we go, but he suggests we leave it in the car. Remembering that we were told to keep the tinted windows down, I say we are happy carrying the kit with us. He insists, assuring us if anything happened he would personally pay for our kit. After prayers we go to a restaurant for a lunch of boiled camel meat, rice and stew. Between chewing the tough camel meat and the soft basmati rice he gives me the news I have been hoping for – the freedom to report from al-Shabab-controlled areas. We return to our car after lunch; our kit is still there, albeit dusty from the strong wind and in full display to all the locals. “This is an al-Shabab area, nobody touches what’s not theirs,” the man tells me. As we begin our drive back to Mogadishu he reassures us of our safety. Feeling a bit more confident, I retort with a smile that while this may be true, we cannot be safe from drone strikes.